Andrea Murina, MD « Cosmetic Surgery Forum – Practical. Honest. Insightful. 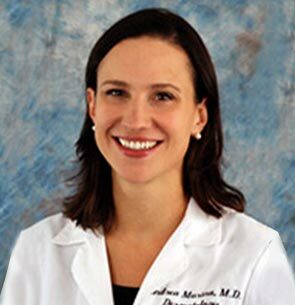 Andrea Murina MD is an Assistant Professor of Dermatology at Tulane University School of Medicine in New Orleans, Louisiana. She completed medical school training at Louisiana State University in New Orleans and residency training at Tulane University, where she served as Chief Resident. Dr. Murina practices medical, surgical, and cosmetic dermatology in New Orleans. She focuses on the latest treatments for acne, psoriasis, and skin cancers. She directs the dermatology clinics at the University Medical Center in New Orleans and the Tulane Cutaneous Oncology Clinic. She is the author of multiple scientific papers and book chapters, and an investigator in pharmaceutical trials. Dr. Murina serves as Dermatology attending at the Fleur-de-Vie student run health clinic in an underserved area in New Orleans. She coordinates public skin cancer screenings to increase public awareness about melanoma and the dangers of tanning beds. Dr. Murina been interviewed on WDSU and WLAE, New Orleans television networks, regarding sun safety, skin cancers and cosmetic safety. Dr. Murina has a strong passion for teaching and exploring new ways technology can help us learn in the future. In 2015, she was awarded an American Academy of Dermatology grant to produce a program for innovative continuing medical education in dermatology (PICMED). She is rarely ever bored and has three sons that keep her busy in all her spare time.